Dressed in a beautiful finish and featuring appointments you'd often find on higher-end guitars, the Epiphone AJ-220S guitar sounds just as good as it looks. Built on advanced jumbo body design, the depth of the body and the width of the shoulders create a large sound chamber, presenting tone that is full, deep and loud. The mahogany back and sides, paired with a solid Sitka spruce top brings out rich harmonics, lots of projection and clarity in tone. 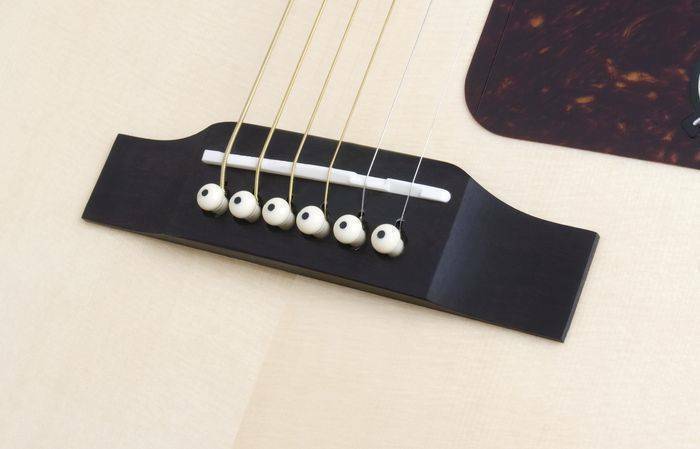 A glued-in, dovetail neck joint keeps the Epiphone acoustic guitar's neck and body stable, without losing any subtleties in tone. 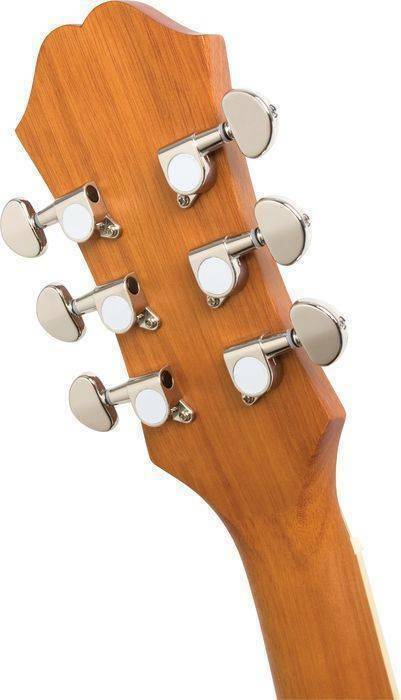 The mahogany neck adds strength, as the wood is quite durable and will stand up to the elements. The rosewood bridge and fretboard produces lasting sustain in a deep appearance. have played piano by ear for years and now decided to branch out into guitars. Researched via web and stores to hear the tone. Plus, this was part of the student pool at the music lesson center. Made for a deep discount on the pricing !! The fingers are starting to blister cause I just LOVE the deep rich tones and ability to get some great volume when I want to. Soooo Happy !!! You will be too. So, you've been playing for some time now, and want to upgrade your plywood strum-box to an authentic tree wood guitar. Well, step right over here young man/woman/dog/pony to the enchanted epiphone emporium. A good guitar for the price. A bit old fashioned, thickish neck, moustache headstock type of thing. Despite the nice spruce top, the bracing is thick and the bass is fairly weak, even with medium phosphor bronze strings. It is biased towards mids and highs and within this range tonal clarity and loudness is better than laminate guitars. Frets come fairly gritty but will probably smooth out. It is smaller bodied than most Yamaha jumbo bodies. I've gone back to yamaha jumbo's since my time with this guitar, for overall fit and finish, and bass response. Awesome sound, Very playable, Finish and quality is fantastic, Can't beat it for the money, this is my third epiphone and I cant say enough about there guitars they are worth looking at and playing, from the beginner to the pro. you will not be disappointed with Epiphone Guitars. I also play a Washburn and a fender but my Epiphone in my go to guitar. its the most comfortable guitar I own. One year ago I bought this guitar, my first. I had the guy in the store play all the guitars in this price range and this one sounded best. Now that I can play a bit I have tried other guitars more expensive guitars and this sounds and feels as good as anything. In the 200 dollar range you cant go wrong and it seems that it is sounding better with time. I walked into the store after a meeting in sackville and basically had myself convinced that I was going to get a yamaha. I am a beginner and from what I read online they were "the best bang for your buck". But after playing several guitars (yamaha included) I kept coming back to this one. I just knew it was the guitar for me. I had a friend play it and she fell in love with it as well. It was so easy to play and I loved the sound. the guitar is very flashy especially with the sun burst finish. it has a great sound and stays in tune. i would say it is better than the Yamaha F325. I tried a few different guitars in the store. But kept picking up this one. I went home did some research and went back and picked her up. I was looking for a regular, not overly expensive accoustic guitar. I didn't want to spend anything more than 250$. For the price, this is a wicked guitar!!! Best bang for your buck. Recommend to anybody!!! I own a few epiphone guitars now, and they are fabulous, great quality at a great price.